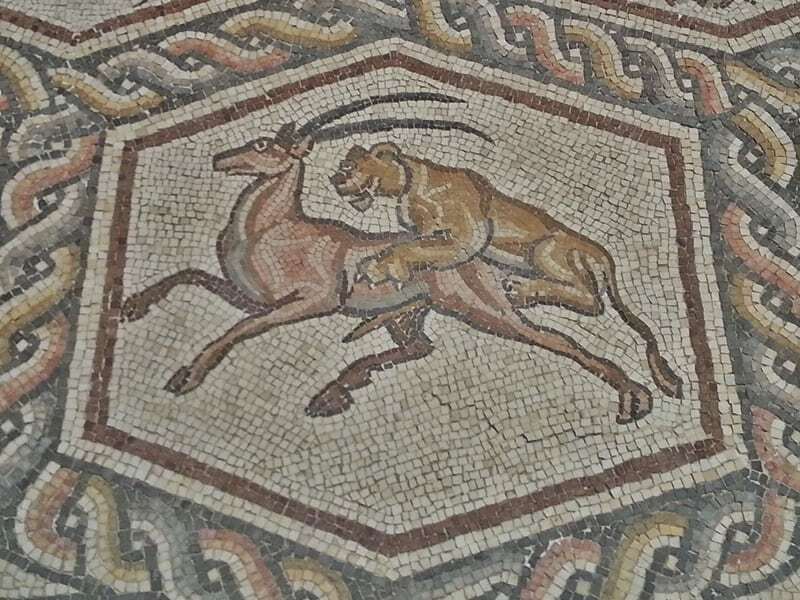 A chance find during road works in the town of Lod, south east of Tel Aviv, brought to light a remarkable Roman mosaic floor. 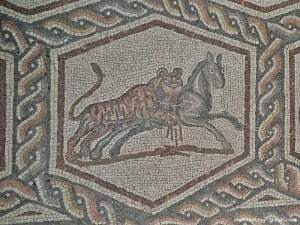 Not only is the subject matter of mosaic intriguing, it is also one of the better preserved of the larger mosaic floors from the Roman period. Since its accidental discovery in 1996 and following extensive conservation, the Lod mosaic has been touring art galleries and museums around the World. I recently saw it at Waddesdon Manor (Aylesbury, England), where it is on display until 2 November 2014. The slight references to neoclassicism aside, Waddesdon Manor is not an obvious choice for the display of a Roman mosaic. 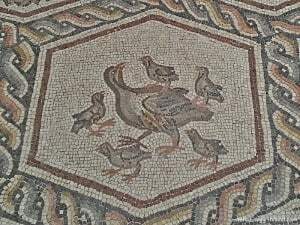 Rather, there is something of an irony in visiting one of England’s stately, countryside houses to see one of the most spectacular mosaics from the Roman province of Palestine. 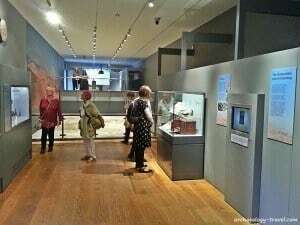 Many Romano-British scholars and archaeologists have long since recognised similarities in the way in which we imagine the Romano-British villas of two thousand years ago and the grand country homes of the United Kingdom of more recent times. 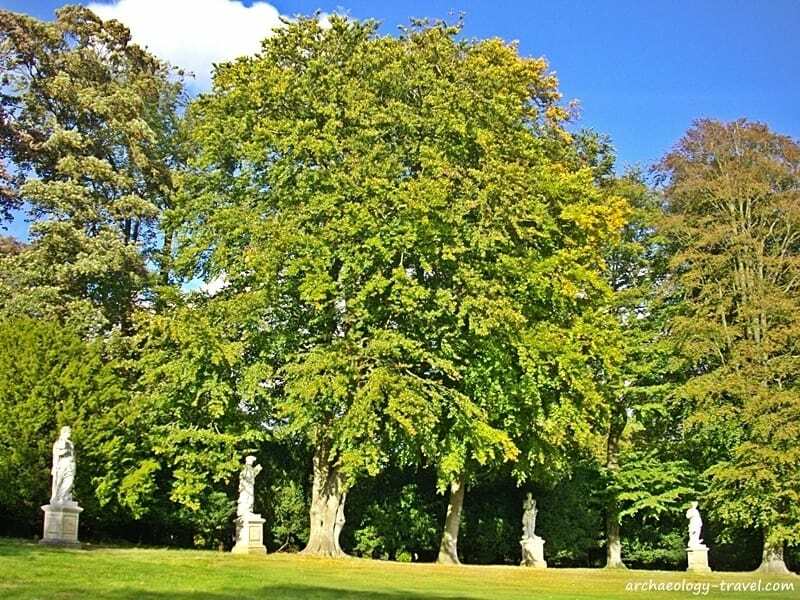 Typical neoclassical statuary at Waddesdon Manor. 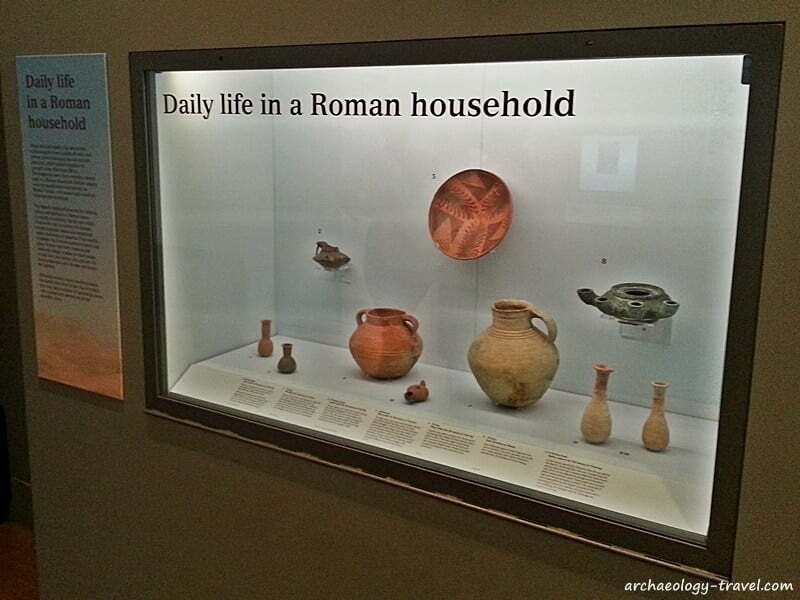 Roman villas, like English stately homes, were situated some distances from urban centres. These rural Romano-British residences were large and quite opulent – some more than others of course, and obviously belonged to wealthier elite. The same is true for their more recent counterparts. One of the striking features of these Roman villas, throughout the Roman world, was how richly they were decorated. Marble and stone sculpture would have been on show both outside and in, the interior walls were painted and the floors had mosaics. 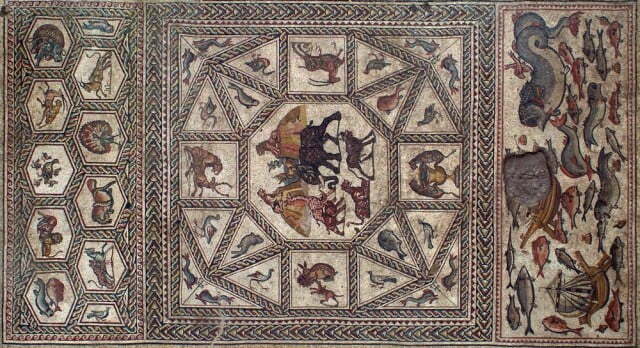 Those rooms that are thought to have had a more public function had some elaborate and exquisitely detailed mosaics. 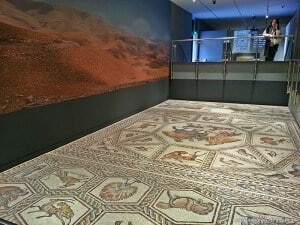 The mosaic floor now on display at Waddesdon Manor was found in the remains of a Roman villa in present-day Lod, or Lydda in Roman times. For various reasons I have missed seeing this mosaic as it toured the United States of America and Europe during the last few years. 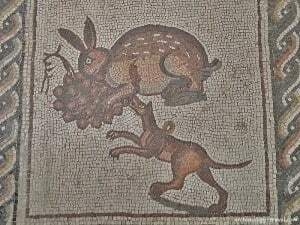 As Roman mosaics are my favourite kind of archaeological artefact (second to cave art of course), I was delighted to be able to catch up with it finally in England. 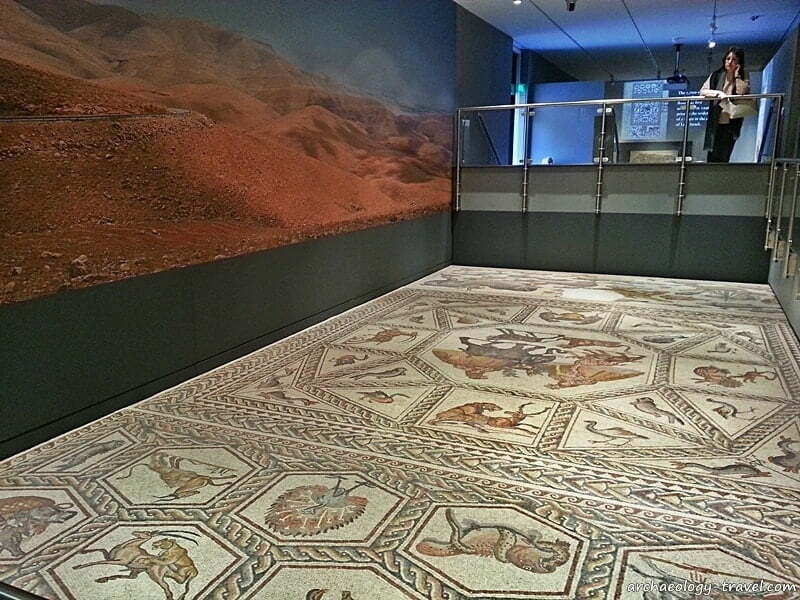 The Lod mosaic (illustrated in its entirety above) is remarkable for two main reasons. First, as large mosaic floors go it is very well preserved and almost complete, with only one patch that has not survived intact. Thankfully this missing area is not that large that it raises too many questions about what was depicted there. 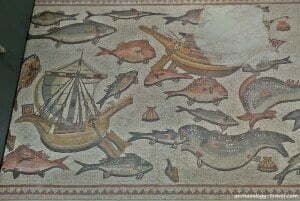 A part of one of two merchant ships and the heads of a few fish are missing. 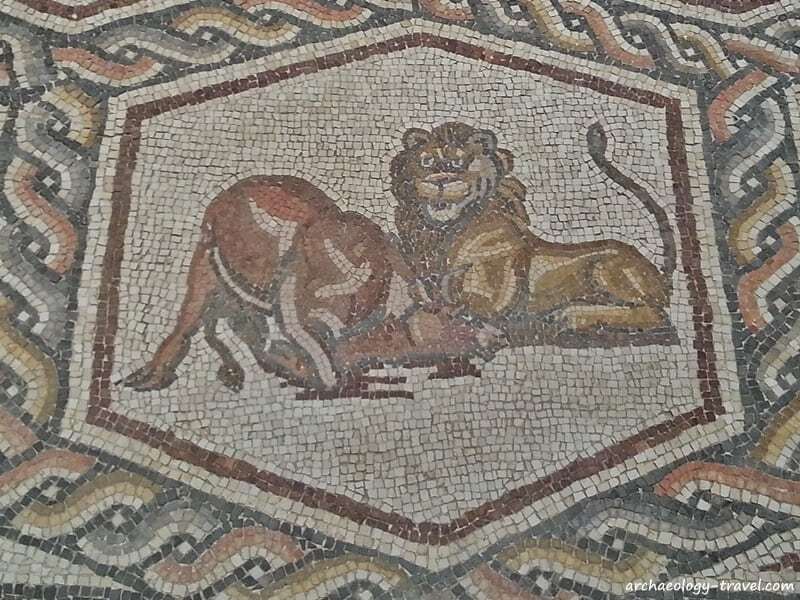 This extraordinary state of preservation is all the more remarkable when you consider that the mosaic floor was discovered by accident during the construction of a road south east of Tel Aviv. 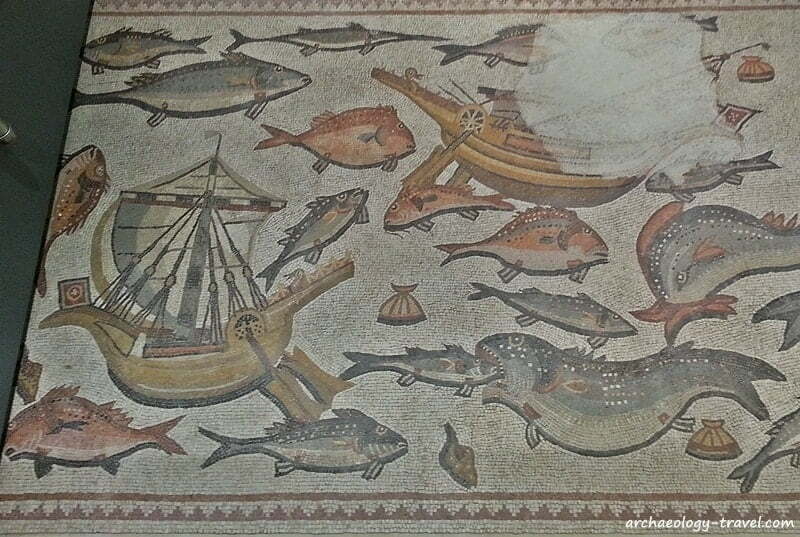 The second remarkable feature of this particular mosaic is the subject matter. 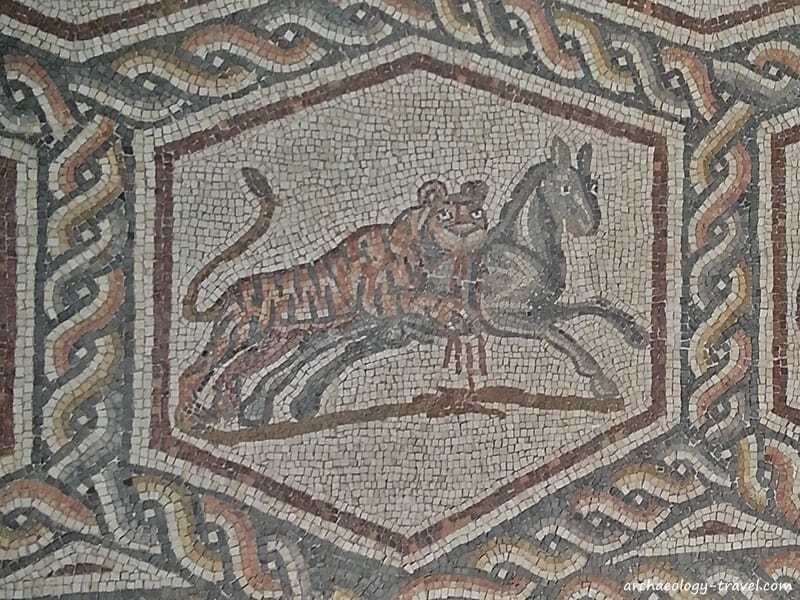 While there are certain standard designs that can be seen on mosaic floors throughout the Roman world, there are a number of unusual features that are very intriguing. 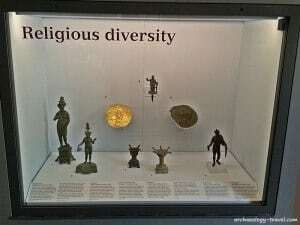 For a start, anyone with any familiarity with Roman mosaics will immediately notice that there are no human figures or gods depicted. The only reference to humans are the two merchant ships, a basket of fish, and four tridents – which could be a reference to Neptune. Otherwise the subject matter is of wild animals, birds and fish. This juxtaposition of a marine theme with wild mammals, obviously both hunters and the hunted, is unusual. 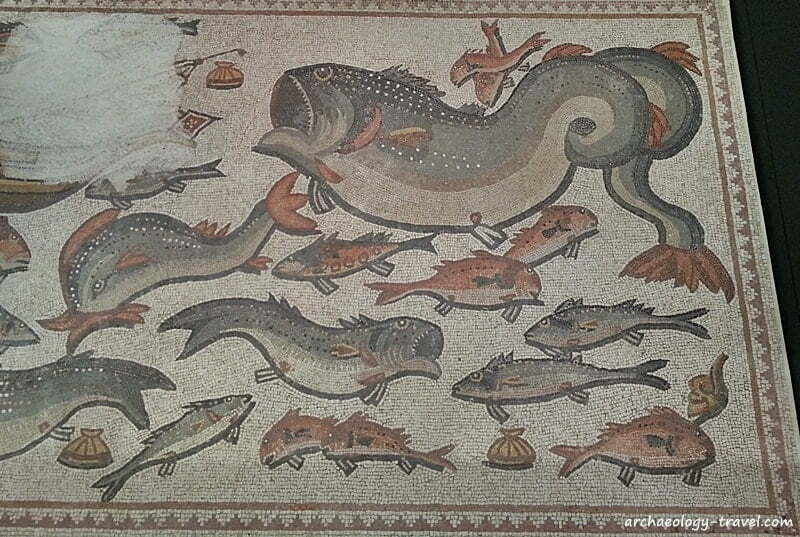 And some of these animals would have been unknown in this part of the eastern Mediterranean. Lion eating a wild ox. The Stables at Waddesdon Manor. 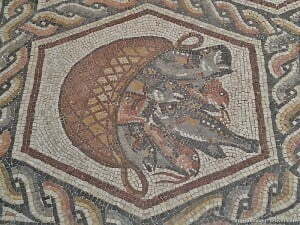 The exhibition, entitled Predators and Prey: A Roman Mosaic from Lod, Israel, is housed in the converted stables of Waddesdon Manor. Having only seen photographs of the exhibition in any of the other institutions, the narrow space of what were stables works well here. As you enter there is a small area where you are invited to sit and watch a short video about the site where the mosaic was found, and then its removal from where it has lain for about 1,700 years. It is a amazing bit of footage (click here to see the video), and I and a few other visitors audibly held our breath at more than one point as we watched this artefact being lifted. 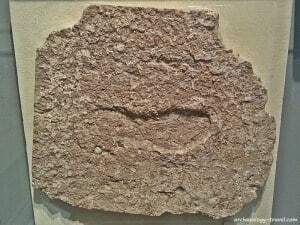 Footprints of the Roman workers were also found in the mortar, and these are also on display here, adding an authentic human touch to what you are about to see. 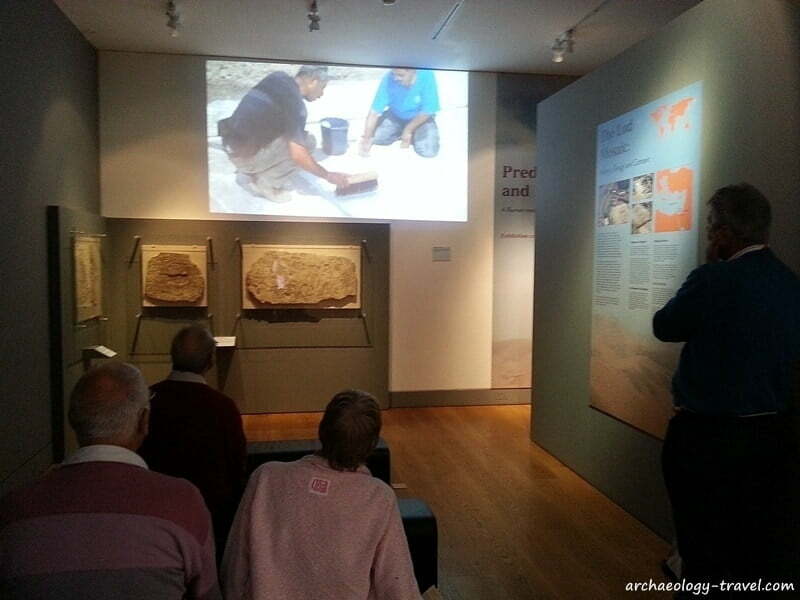 Watching the video of the discovery and removal. 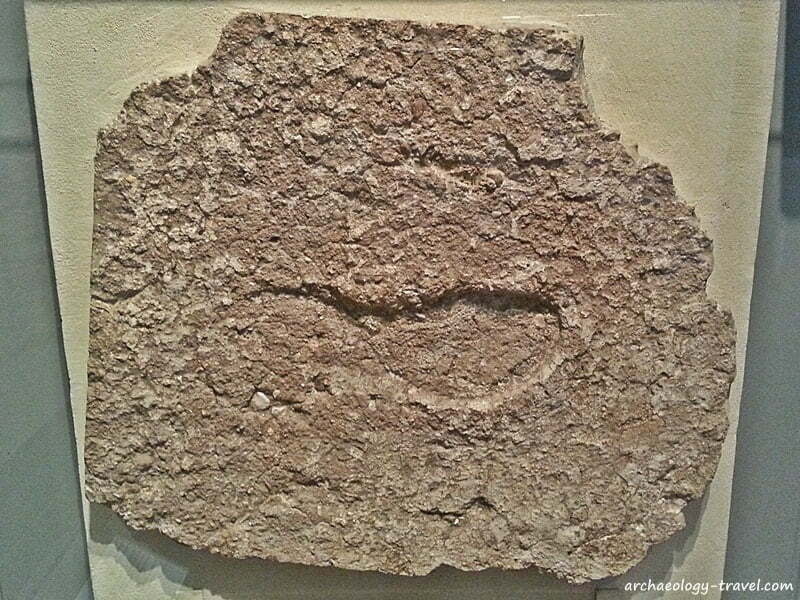 A sandal bearing footprint solidified in mortar. Then you get to see the real thing and appreciate how remarkable it really is. 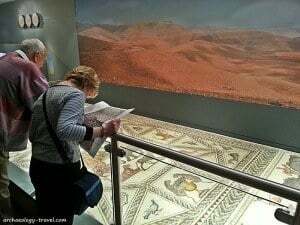 As spectacular as seeing this mosaic is, and for anyone with an interest in ancient or Roman art I urge you to do so, there really is not much more to the exhibition than the mosaic itself. And in my opinion there is nothing wrong with that. 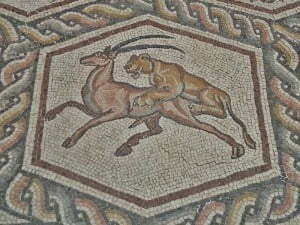 The presentation in the Stables at Waddesdon enables visitors to get a good look at the mosaic. 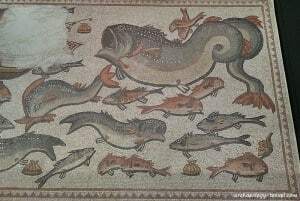 There are two viewing platforms; at one end is a higher platform allowing you to get a good view down on the marine scene, and then a lower walkway along the length of the mosaic. At the other end, you are just above the wonderful vignettes showing the predators and prey, photographs of some are included above. An excellent full colour, annotated plan is provided that provides identifications of what you are looking at. 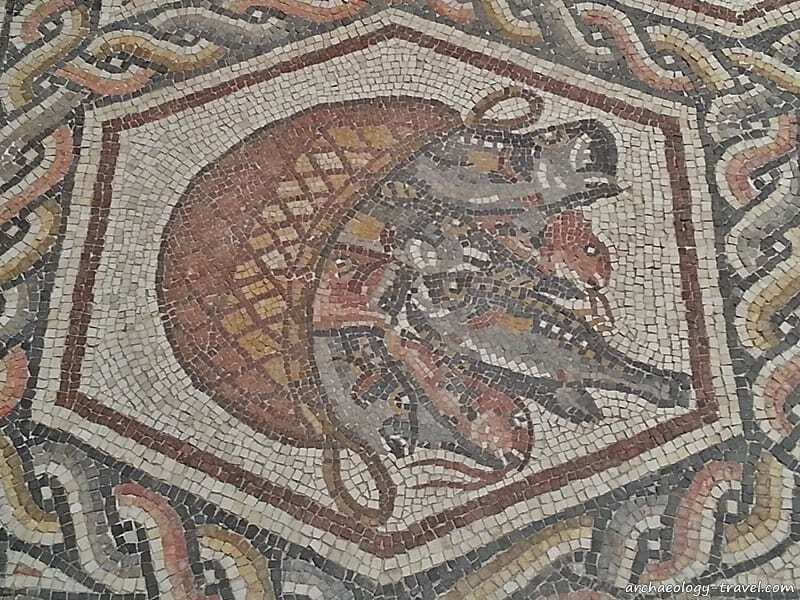 Of course there are some good resources online to allow anyone to explore the mosaic thoroughly (click here for links to these), but nothing beats seeing the real thing. Although I knew the size (but who actually paces it out), I was nonetheless still surprised by the actual dimensions. And then quite taken by the size and detail of the individual images. 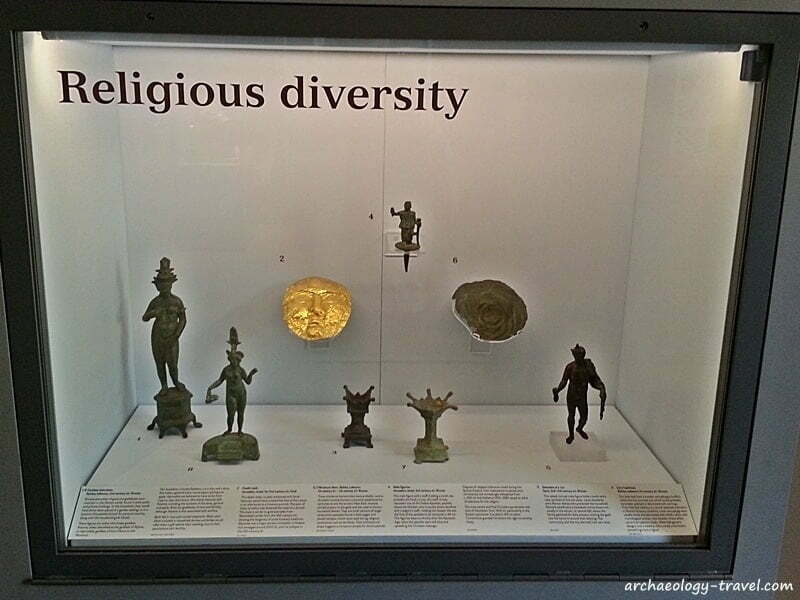 Three small display cases provide some contextual information: daily life in a Roman household, wealth and luxury, and religious diversity. 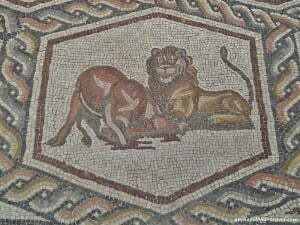 Together these give a good, concise background to the significance of the mosaic – in very general terms. There is no catalogue, or book about the Lod mosaic; surely one is in preparation for when it is finally installed in the Shelby White and Leon Levy Lod Mosaic Center. Viewing the mosaic from above. 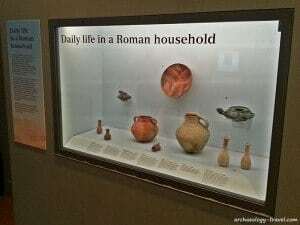 Daily life in a Roman household. A typically French style château. At the back of my mind while marvelling at the imagery was the question ‘why Waddesdon?’ Waddesdon Manor was built as the country retreat for Baron Ferdinand de Rothschild (1839-1898), the main part completed in 1883. It was here that he lavishly entertained guests from the royal, political and cultural elite of London in what was then ultimate country luxury – a country retreat with running water, central heating and electricity. After the First World War, Waddesdon passed to the French branch of the Rothschild family, namely James de Rothschild who in turn bequeathed the estate to the National Trust. 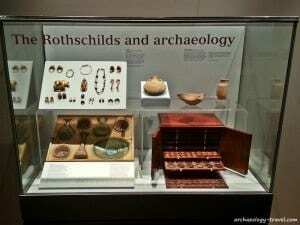 It is the French branch of the Rothschild family that has strong connections with archaeology, particularly with archaeology in the Near East – from where the Lod mosaic originates. 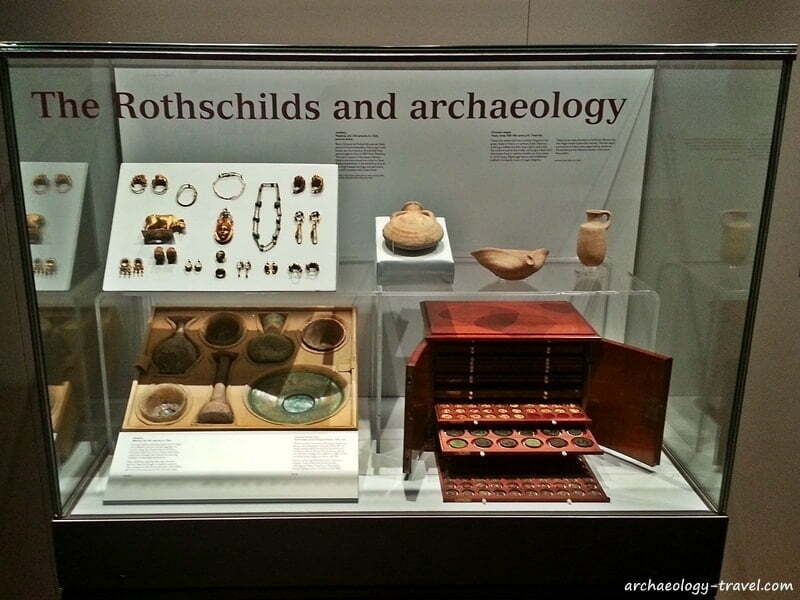 And these connections are explored, through some stunning artefacts from the Rothschild’s collection, in a final display. The family has supported archaeological excavations in the Near East since the beginning of the twentieth century, and continue to do so. The present Lord Rothschild also set up the Butrint Foundation which provides training for the continued preservation of the UNESCO World Heritage site of Butrint in southern Albania. 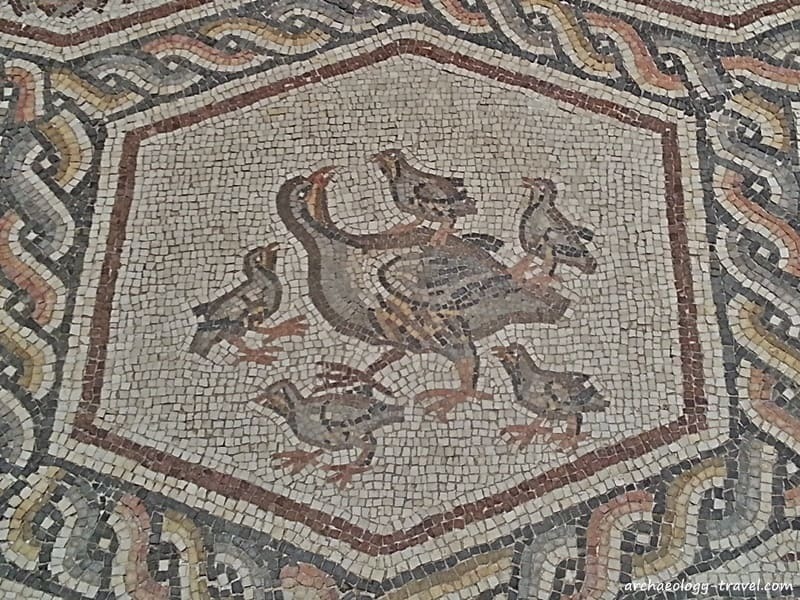 So while the irony of the Lod Mosaic being displayed in one of the grand English country houses continues to amuse me, there is a connection founded on a deep philanthropic relationship with the archaeology of the Near East – whatever its politics. 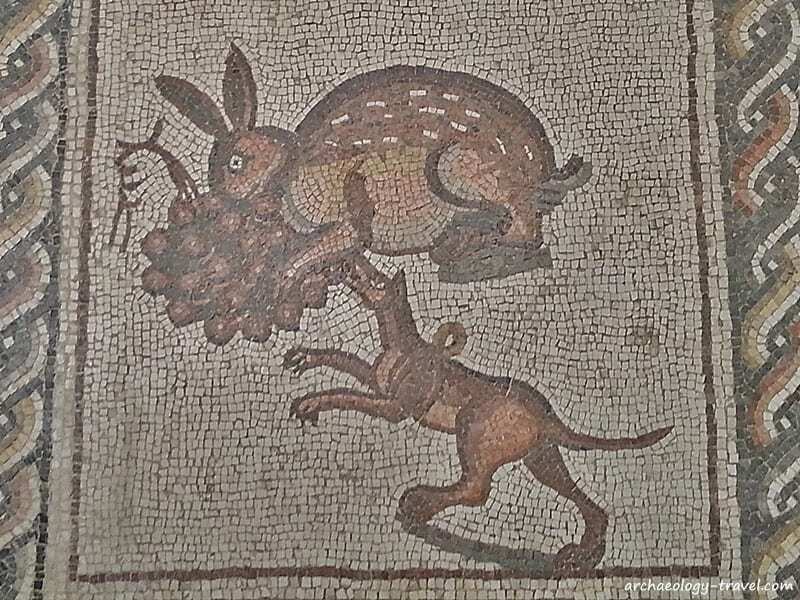 In fact it turns out, the Rothschild’s Waddesdon is an obvious setting for the display of this extraordinary mosaic from Israel. A carpet bed inspired by the Lod mosaic. 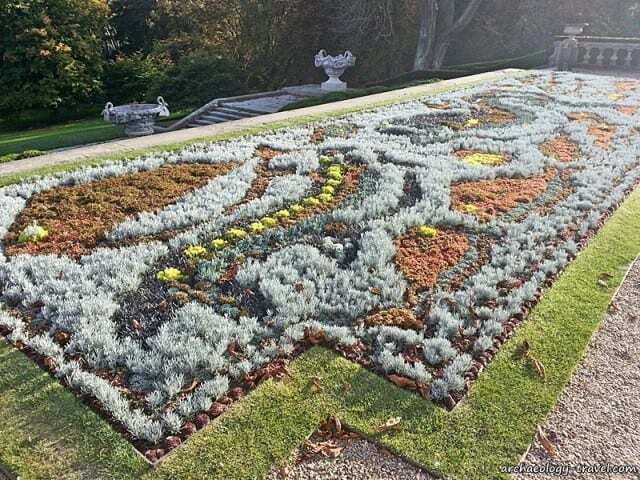 The Rothschilds are said to have pioneered the use of carpet bedding at Waddesdon, both two-dimensionally and as three-dimensional sculpture. Carpet beds are created with alpine and succulent plants that are cut short to give the impression of a pile. In the parterre garden to the south of the château is one such carpet bed, the look of which this year has been inspired by the many and varied fish depicted in the Lod mosaic. 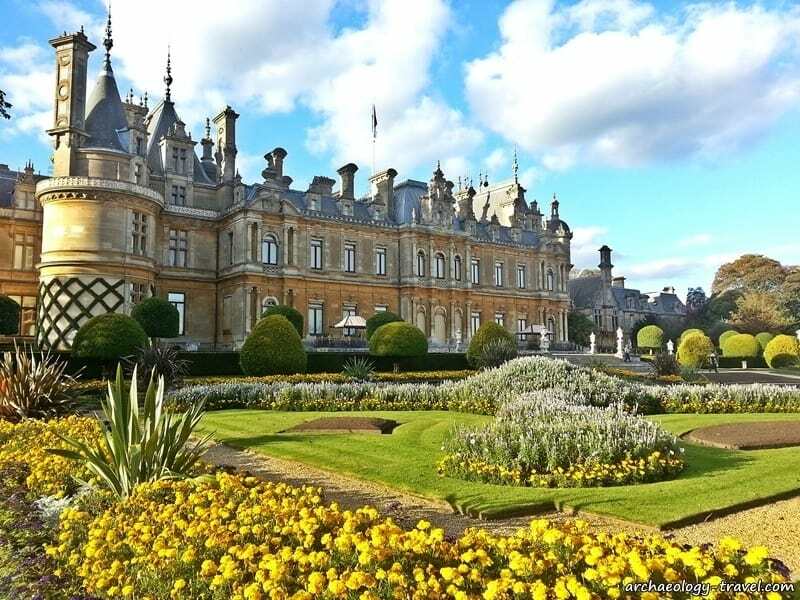 Waddesdon Manor is in the village of Waddesdon, 6 miles outside of Aylesbury in Buckinghamshire. It is easy to get to by car, and about two hours from London by train. There is a regular train service from Marylebone Station in London to Aylesbury, from where you get a taxi to the manor (6.5 miles). 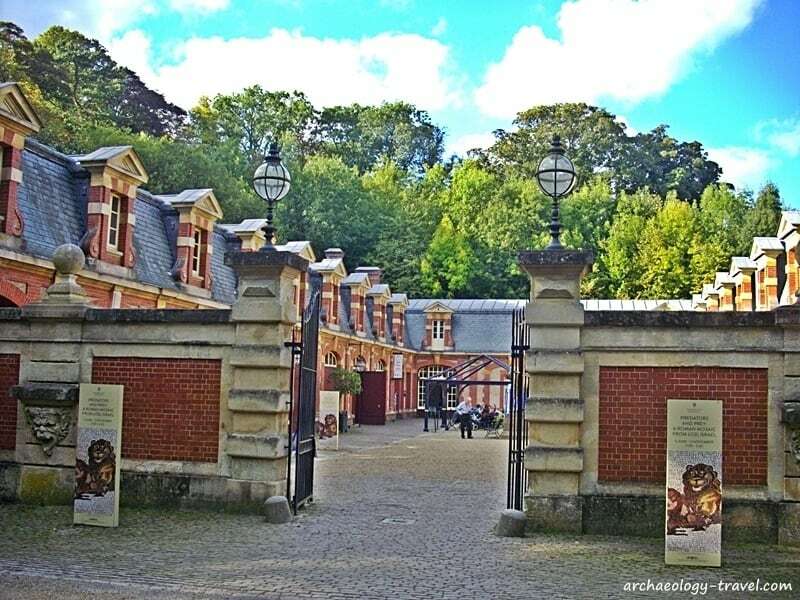 For further directions consult the map above, or visit Waddesdon Manor’s website.